I love anything creative...I am a busy mom of three (+4 dogs, 1 bird, 1 bunny, and 1 sweet husband) who sometimes wishes I had more time/energy/talent to devote to just being creative! I couldn't resist a teeny-tiny new start, I mean really it doesn't even count does it?!? Above is Lizzie Kate's St. Patrick's Day chart for this year. 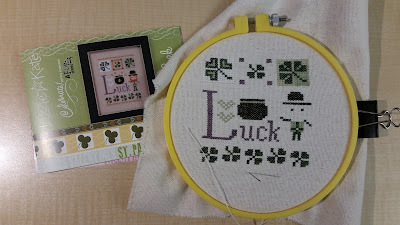 All I need to finish is the threads for my leprechaun's face and the gold for the border. Quick, cute stitch and a good break from all of my Halloween stitches. Here's where I am at on "Remember Me". 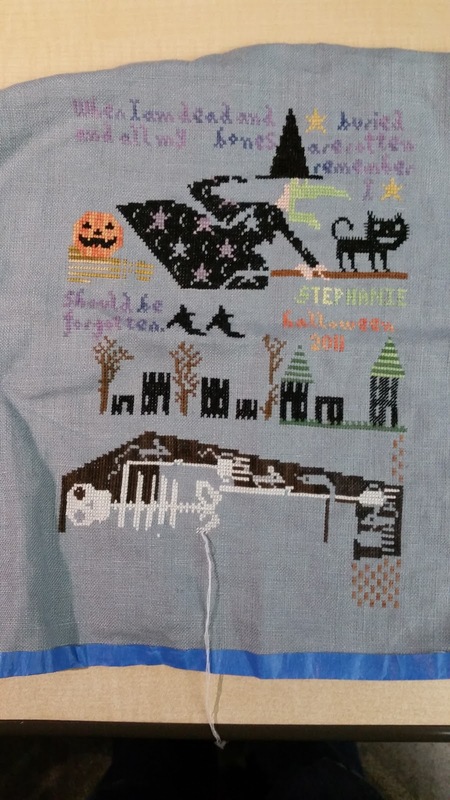 I completed the row of houses (just need roofs on them), dug half of a grave (all that dark stitching is tedious) and my witch now has a dress and a pumpkin companion. 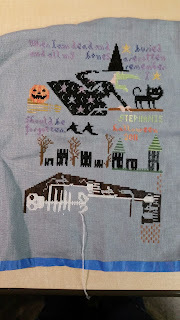 I messed up the skeletons toes, so am hemming and hawing over how much I will have to frog to make them right. This linen is very bumpy/uneven, and I went over three somewhere when it should have been over two. Now the only problem is finding which little stitch threw me off! Below is my SIXTH finish for the year, Drawn Thread's "Halloween Sampler". I changed many of the colors on this one, but overall am really happy with how it turned out. I have organized my WIP list into categories (I know how nerdy am I?) so about 25% of my projects are Fall/Autumn, 25% are Halloween, 25% are miscellaneous, and the last group is all of my big-big projects. My goal for the first three months of this year was 25% of my WIP basket done, or 9 projects. So with six done already and one more month to go I am right on track. Well, as long as I stop adding new projects like ahem the LK at the top of this post. 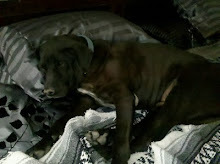 Look away, look away--I just can't help myself apparently! 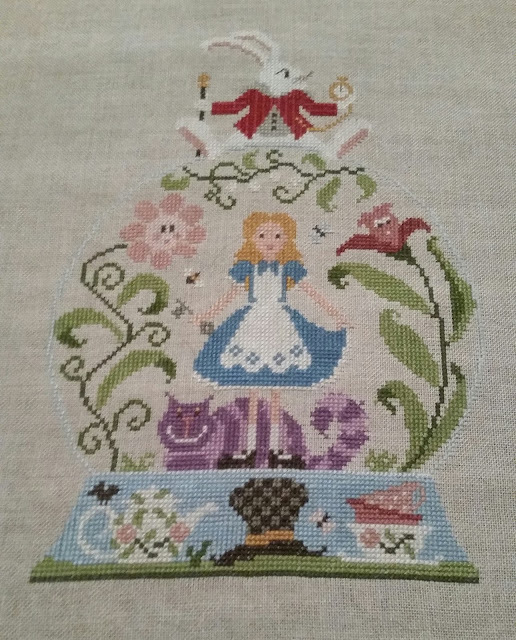 I'll start with my most recent finish, Alice is done! This was a very quick stitch for me, and I loved the softness of the colors in it. 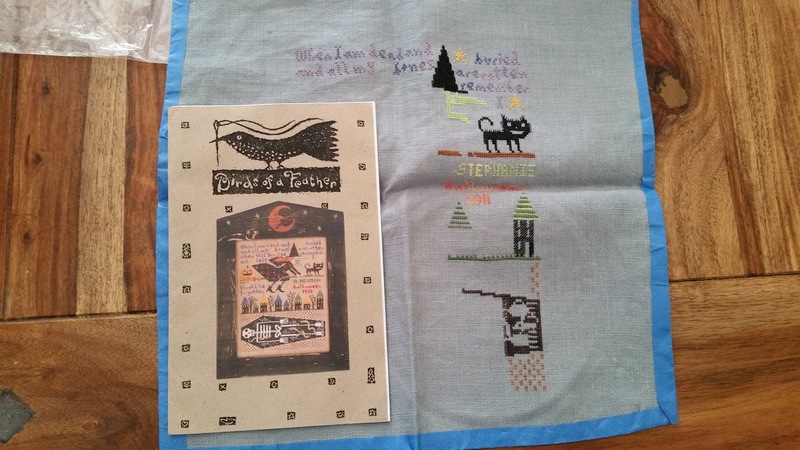 This was my first time stitching a Jardin Prive design, and I have to say I enjoyed the chart too (easy to read, just DMC thread and no blended colors). I am still debating making this into a pillow or a wall hanging, pillows in our house tend to be well-loved! And here is my not so new start. Birds of A Feather "Remember Me On Halloween". I say not so new, because when I went looking back for my starting progress photo I had to go way way back in the archives. The date under the cat says 2011, which means I probably started this in 2010. 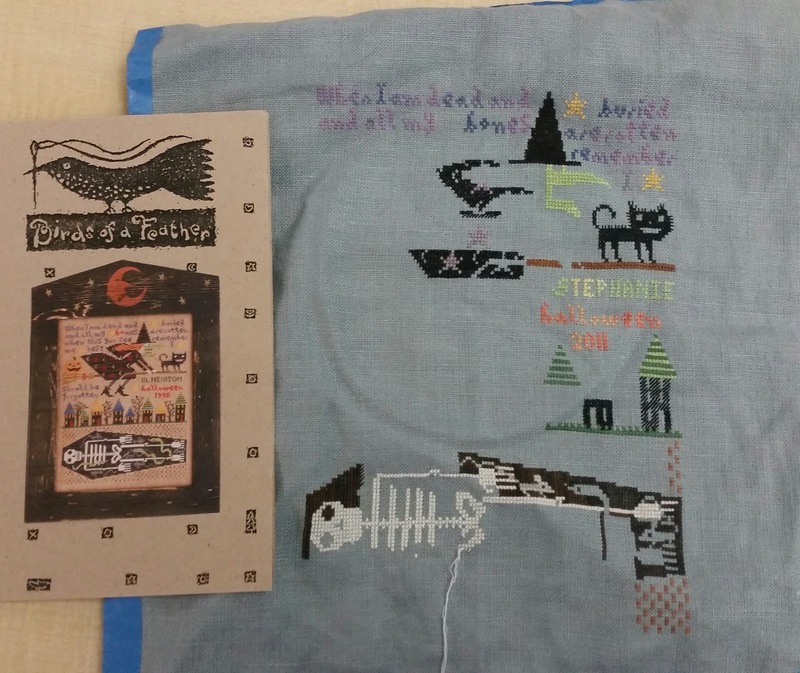 I don't think I have stitched at all on this in the last five years, so it was time for it to see some attention.You'll notice the edges are taped with blue painters tape, and I was very brave in leaving very little margin around my stitching. 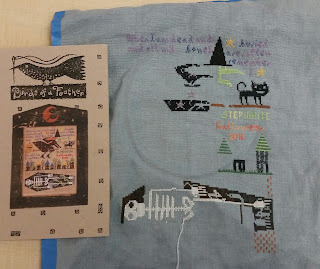 It is funny how much I have learned in my stitching over the years. 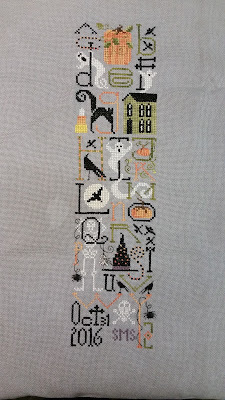 The skeleton is again stitched in glow in the dark white (my favorite for Halloween pieces), and I have changed every single color from the chart to suit what I had available in my thread stash. And here is what I have been reading this week. Watership Down was recommended by a friend of mine, and is a children's classic about a warren of rabbits. At first I was not sure how much I would enjoy it, but it wound up being one of those books I wished would not end. 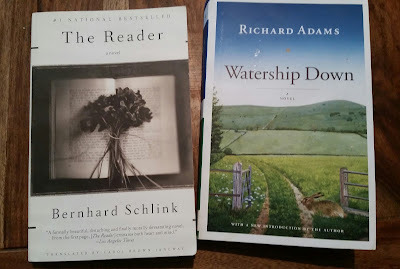 The Reader was my other finish this week. I have not seen the movie yet (starring Kate Winslet), so went into this book knowing only a little of the story. I did like the story, it was a short read, only 200 pages. I looked up some of the reviews of it after finishing it, and it gave me pause to think about the characters in the story. It is about a Nazi prison guard put on trial for war crimes after the war, and her motivations for what she did. I highly recommend both books, but am now immersing myself in lighter fare of Mary Kay Andrews, I love her books for how just light and fun they are. She just came out with a new one called "Save the Date" about a wedding planner who finds love. One of my New Years goals is to read two books a month this year, so finishing these two in the last week of January puts me right on track. "GIVE THANKS FOR UNKNOWN BLESSINGS ALREADY ON THE WAY"